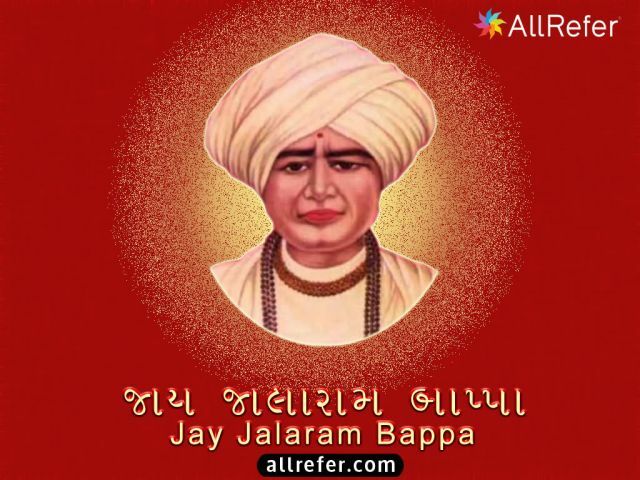 Jalaram Bapa was a Hindu saint from Gujarat, India. He was born in Virpur, Rajkot district, Gujarat. One day, a sadhu who came to his house gave him an idol of Rama, forecasting that Hanuman the monkey-god and devotee of Rama, would follow soon. Jalaram Bapa installed Rama as his family deity and after a few days, an idol of Hanuman appeared out of earth, on its own. The idol of Rama’s consort Sita and his brother Lakshmana also appeared. Due to a miracle the container in the house of Jalaram, where grains were stored, become inexhaustible. Later other devotees and village folk joined him in his works of human welfare. Soon his fame spread as a divine incarnation. Whoever came to Virpur, whether Hindu or Muslim irrespective of caste, creed and religion were fed by Jalaram. This tradition of feeding people continues to this day in Virpur. The main shrine of Jalaram Bapa is located at Virpur. The shrine is actually the house complex where Jalaram lived during his lifetime. The temple is one of a kind in the world in a way that it has not been accepting any offerings since 9th February, 2000.